I know a lot of people who have some really cool looking tattoos. But perhaps, that isn’t saying much considering that I know a lot more people who have hideous looking tattoos. I suppose that beauty truly is in the eye of the beholder, and we all have our opinions. The thing is, these opinions tend to change. And many of the people I know who have what I consider to be “ugly ink”, actually agree with me. We’ve all made bad decisions. And making them is meant to teach us lessons to learn from. A tattoo, however, is a constant reminder about this bad mistake. Take tattooing the name of a boyfriend or girlfriend somewhere on your body. What happens if you break up? I have a friend who has been through this. So there is a good thing that Laser Tattoo Removal exists. What once seemed a good idea may eventually become something to laugh about. That is, of course, unless your idea left a permanent mark on your life. In the case of tattoos, this is literally true. I suppose there are ways to get around it. We can always wear long sleeves and other types of clothing to cover up our tattoos. But how fun is that going to be when it’s time to go swimming this summer? For the most part, people get tattoos as fashion statements. But sometimes the fashion doesn’t suit the occasion. People have removed their tattoos for all types of reasons for laser tattoo removal ranging from securing a new job to setting good examples for their children. After all, it’s a bit tough to tell your kid to avoid trouble when you have a skull and cross bones and the words “kill or be killed” splattered across your back! As mentioned, this is one of the top reasons for laser tattoo removal. In a special to the Chicago Tribune, Chris McNamara writes of the reasons for laser tattoo removal he discovered that some people visiting the Hindsight Tattoo Removal clinic had. Mollie Linn is one such person who visited the aptly-named clinic for the purpose of making a good impression on her would-be employers. Her parents actually bought her a tattoo-removal session as a birthday present. The 23 year-old was in the market for a position as a nanny and didn’t want parents assuming she was unfit to look after their children because of the peace sign on her wrist. If you want to make a good first impression, she figured, it would be wise to keep your skin free of unnecessary ink. 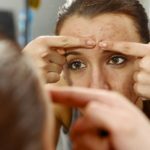 The clinic’s owner Bob Jones notes that another popular reason for tattoo removal is the fact that “styles change, making designs that were hip 15 years ago seem silly today.” He points out that many trends that were popular in the 90s – he points out Chinese symbols – are no longer in style. In addition, many tattoos from years passed were done with poor craftsmanship. Also, as mentioned, we all often have to move on from relationships gone bad. But how can you when you have a tattoo to remind you of the one you just left? Bryna Hahn felt this way about the thick blue waves on her forearm which reminded her of a past love she wanted to forget. 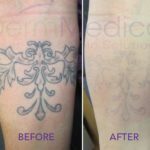 If you’d like to forget about keeping those tattoos of yours, give DermMedica a call toll free at 1-866-861-3070, or if you are in Kelowna, call 250-868-3070.